There are a lot of luxury startups these days and the jet charter industry has recently seen a lot of “disruption” in the past decade. Ten years ago you’d scoff at the idea of chartering a jet on your phone, sending your credit card information willy nilly to some company. A lot has changed and the convenience and ease of the mobile app world has made luxury travel pretty splendid. What seemed to be a luxury startup on the move back in 2012 with some “celebrity” startup capital being touted in the initial PR pitches. I would have been happy with some of the coverage up until they unfortunately had some bad press which seemed to sting a little. Despite their bad and good press I wanted to take a look at a few areas this brand was severely hurting. I don’t want to come off as mean, but in this day and age of talking the talk you’ve got to look the part. While they had some celebrity backing buzz surrounding their name, the overall brand feel seemed to fall flat. 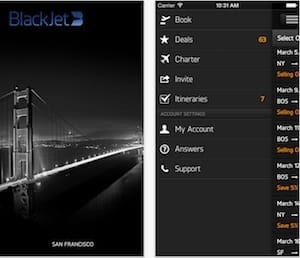 The main focus of BlackJet was their mobile app which made it easy to find empty leg flights, charter your own jet and so forth. 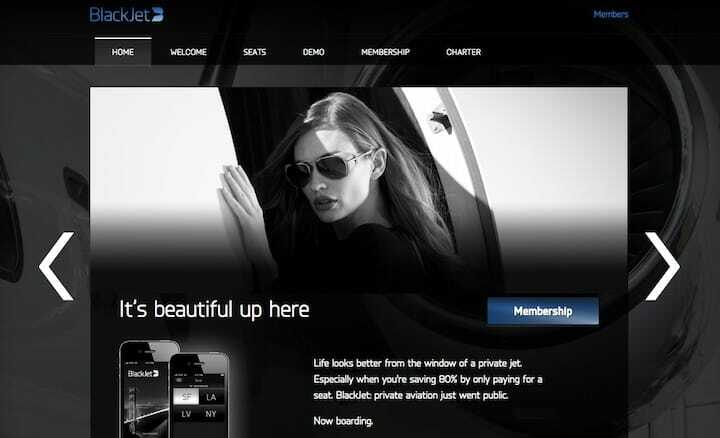 It was supposed to be the “Uber of private jets” and while it did work for a while, problems arose and users didn’t flock to the platform. First impressions are key and I will say their mobile app was pretty slick and the branding was spot on. Jumping over to their website and you were left with an odd feeling. It didn’t quite match up to the slick UX their mobile app had. Not only that, but that lack of branding bled into their social media channels and we’ll get into that a bit as well. Again, I’m not trying to be mean but rather learn from others mistakes. When you have competition like JetSmarter and Victor who have excellent branding and marketing strategies in play, it’s hard to compete when you don’t look the part. Sadly they really skimped on their website experience and it doesn’t have a luxury feel at all. There’s not a whole lot of information on here either including who’s at the company, any form of content marketing and no social media integration. 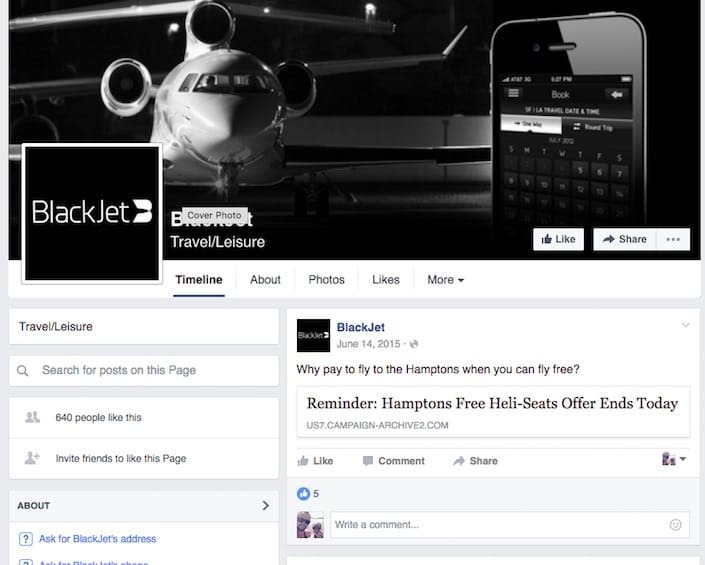 Again, talking about JetSmarter you’ll see their website experience is elegant, luxurious and modern. It has company information, tons of blog content, press coverage and useful information on using their service. It’s a whole other level they’re on and from this alone I could see why users wouldn’t bother going the BlackJet route. Secondly, there was no video efforts made or at the very least a commercial. The competition was making heavy use of video marketing and in this day and age it’s a sin not to. Attention span’s are little and visual content goes a long way in branding so why they didn’t start out with it boggles the mind. Facebook updates and interaction was pretty much nil and it all felt inorganic, uninspired and there’s no passion bleeding out anywhere. I want to feel apart of the brand and have some fun instead of dry business related updates only. While some may read that and think, the whole point is to make sales. While that’s true, this however is a lifestyle brand and requires a different kind of marketing. First of all, the cover photo is grainy and a very poor resolution. The graphics they had done are just plain amateur hour and I imagine they tried to save a lot in marketing costs pushing this to market. The updates are also just automatically posted via the Mailchimp API which means they haven’t been edited. There is no post picture with their updates and it leads directly to a dry newsletter. There’s no lead capture in place either so they were missing out huge on capturing UHNW & HNW clients. Sadly these are the basics and when missed can really make your brand looks a bit soggy. They also didn’t at all utilize their star power as some of the backers have quite the mouthpieces and personal networks. It’s too bad those weren’t tapped into. Keep in mind they were jumping into a new area of the charter industry and someone had to get their hands dirty. I wouldn’t doubt that some of the founders are planning for a relaunch with all they’ve learned in the past few years. I’d love to hear your thoughts below as well so please comment away or come join us in the luxury marketing forums on LinkedIn. If you’d like to change the way your aviation company looks and acts then please get in touch with us about our jet charter marketing services.